(Nanowerk News) National University of Singapore (NUS) physicists have designed a bipedal nanowalker that can change its walking manner and direction by adjusting the length of its stride (Nanoscale, "Inchworm bipedal nanowalker"). A bipedal nanowalker may move along a track in either the forward or backward directions using different types of gaits (walking manner). It can adopt a hand-over-hand (HOH) gait in which the walker’s two legs alternately lead one another, or follow an inchworm (IW) gait in which one leg always leads the other, like a crawling worm. For the same nanowalker to be able to switch directions and have different types of gaits represents a higher level of nanoscopic motion control that remains challenging. A team led by Prof WANG Zhisong from the Department of Physics, NUS has developed a bipedal nanowalker that can switch between the forward and backward motion and between HOH and IW gait by changing the walker’s stride size. 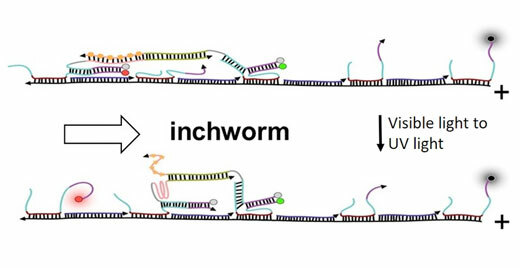 The track which the DNA walker “walks” on is made of a periodic array of identical single-stranded DNA footholds separated by a double-helix spacer. The stride size of the walker is controlled by changing the length of this spacer. The research team found that when the spacer is short, the walker uses an IW gait and moves towards one direction of the DNA track. When the spacer is elongated, the walker moves in the opposite direction and changes to a HOH gait. When the spacer is further elongated, the walker continues to have a HOH gait but reverses direction again. These findings show that the walking manner and movement direction of the DNA walker can be controlled by modifying the stride size, which corresponds to the spacer length. The DNA walker has two identical single-stranded “legs” connected together by a rigid molecular bridge that can change between a long double-helix structure and a short quadruplex structure under different lighting conditions. By alternating between ultraviolet and visible light, the DNA walker undergoes a reversible extension and contraction as it changes between the double-helix and quadruplex structures. Due to an asymmetry in the binding potential of its “legs” to the track, a walking motion is created when the DNA walker is pulled forward and backwards.